Mammography technologist Mary Brechbiel, RT (R), (M), (MR) with one of our new 3D mammography units at our Wake Forest Mammography office. RALEIGH, February 19, 2016 — Wake Radiology, the Triangle’s leading provider of outpatient medical imaging, announced today that is has increased patient access to 3D technology by having a total of eight 3D mammography units in its offices throughout the area. Patients can now request a 3D mammogram at the practice’s Wake Forest Mammography office making it the sixth Wake Radiology location to have this service. 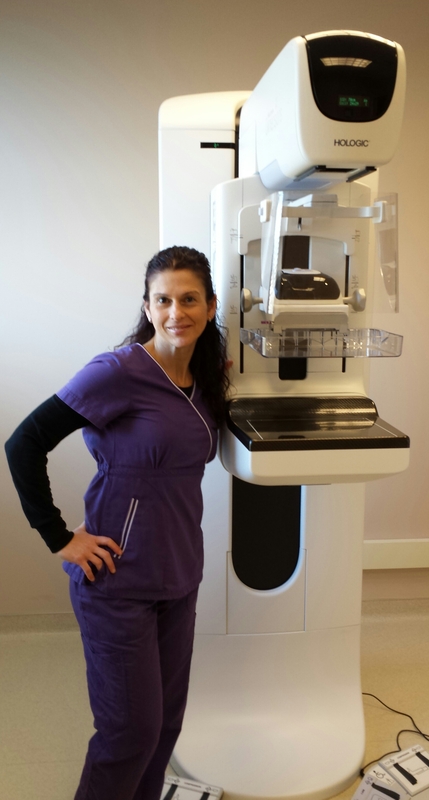 Responding to patient demand, Wake Radiology also added additional 3D mammography units at both its Cary and North Hills Breast Imaging offices this month. Now with twice as many units as any other local imaging provider, Wake Radiology is the Triangle leader in advanced breast imaging. A 3D mammogram is performed in conjunction with a traditional 2D digital mammogram to create a more complete picture of breast tissue. During the 3D portion of the exam, the X-ray arm sweeps in a slight arc over the breast, taking multiple images. A computer then produces a layered 3D image of the breast tissue allowing a radiologist to scan through the one millimeter images like pages in a book. Said another way, 3D mammography provides greater detail and allows the radiologist to see “inside” the breast layer by layer to find cancers earlier than ever. More information about 3D mammography is available at WakeRad.com. From the practice’s website, patients can also learn how this technology is supporting the early detection of breast cancer. About Wake Radiology Founded in 1953, Wake Radiology is the Triangle’s leading provider of outpatient medical imaging. Its physicians have been trained as experts in specific imaging specialties – ranging from breast cancer detection and pediatrics to sports medicine and neuroradiology (brain and spine) – to accurately diagnose healthcare issues. Another hallmark of Wake Radiology is its commitment to low-dose imaging and the elimination of unnecessary or duplicate exams. This approach strives to improve patient outcomes and reduces the overall cost of healthcare. Wake Radiology is the region’s largest outpatient imaging practice with nearly 50 radiologists who perform close to 600,000 procedures each year. It has 20 outpatient locations and provides imaging services at several area hospitals, including WakeMed Health and Hospitals and Maria Parham Medical Center. It is the first outpatient imaging provider in the Triangle to earn the American College of Radiology’s prestigious Breast Imaging Center of Excellence designation. Wake Radiology is an independent, locally owned and physician-led practice that actively supports the local community. Learn more at www.wakerad.com. Media Contact For more information, contact Robert Brown at robert@nullrbpr.com or (919) 810-1901.